It is with profound sadness that the family of Jane Mary Poupart announce her sudden passing at the age of 63 years. 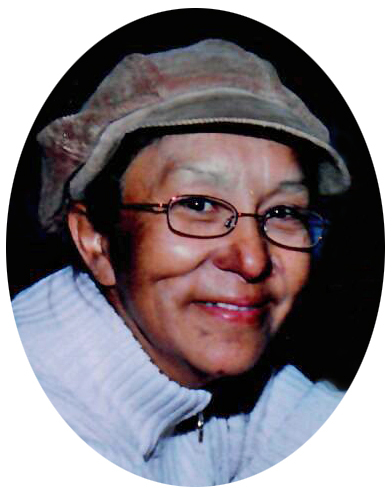 Jane was surrounded by the love and faith of her family in her final moments at the Royal University Hospital in Saskatoon. Jane lived a fulfilling life as a mother, grandmother, wife, sister and friend. She loved knitting and crocheting and was a very talented beader. Her warm smile and heartwarming laugh will be missed by everyone who knew her. Jane is survived by her children Dale (Angel), April, Janice and Jack; granddaughter Hannah; sisters Margaret, Albertine, Louise and Irene; brothers George and Adrian; not to mention countless nieces and nephews that she loved dearly. She was predeceased by her husband Victor Poupart as well as her parents William and Jean Herman and her two brothers Harvey and Egide Herman. We all loved her immensely and she will be greatly missed. Memorial donations may be made to the Rosetown & District Health Centre Foundation Inc., P.O. Box 653, Rosetown, SK, S0L 2V0.